In 1998, Ishmael Omondi, founder of athletic outerwear brand MUDAXpro and nonprofit Big Dream Vision for Orphans, had a product idea come to him. At the time, he was growing up in Kenya. His idea was inspired by his surroundings. Omondi transferred to Dallas Baptist University (DBU) to play basketball for coach Blake Flickner and focus on an entrepreneurial line of study. After graduating DBU with his Bachelors and earning his MBA at West Texas A&M University, Omondi took some fashion design courses to understand today’s styles as they related to the product idea he had in Kenya so many years before. Once he had his design foundation, he collaborated with high-end textile mills, garment manufacturers, and pattern makers to design his first prototype. While building his product, he introduced the idea for his brand – MUDAXpro – to his friends. Omondi wanted to create an athletic outerwear brand that was fun, cool, technical, and personalized. He operated on the belief that everyone should have a unique style of fashion that motivates them to live actively. An athlete himself, he wanted to give customers fashionable inspiration to enjoy working out in color and style, without spending a fortune. When he was growing up in Kenya, unlike the children of wealthy families, he saw that most orphans couldn’t afford new athletic wear jackets to match their outfit. After immigrating from Kenya to Dallas, Texas on a university basketball scholarship, he realized that he had bought eight, $140 Dri-fit jackets plus matching shoes. Maintaining a full roster of diverse athleisure was simply too expensive for many people. Cash donations started flooding in immediately, and Omondi exceeded his initial goal of $5,000 for the Kickstarter campaign. Once Omondi had shipped out his first batch of jackets to the Kickstarter backers, he asked for customer testimonials to market his brand. Omondi spent two years developing the idea for his reversible outerwear jacket and making four garment samples. During this time, he thought carefully about the specifications for his jacket and how he wanted to design it to make people’s lives easier. “When doing daily workouts, we realized that adding whichever color you love as a personal touch to the jacket boosts morale for a person, without having to buy several different jackets that cost a fortune!” said Omondi. MUDAXpro outerwear jacket has a middle strip zipper, that is removable from the jacket and can be reversed and swapped out to your preferred color to match your shoes, pants, or any outfit. It was also important that the jacket be lightweight and waterproof, which is why he chose 100% polyester as his jacket fabric. He knew that it would be easy to pack and roll up the lightweight jacket in a suitcase for travel. Omondi contacted Sean Bilovecky at The Pattern Makers to make his first pattern. Once his pattern and tech pack were completed and handed over to him, the next step was to find a quality manufacturer. He reached out to MakersValley. He sent his MakersValley account manager his product patterns, and we connected him to an Italian manufacturer who quickly went to work making his first sample. Thanks to Omondi's successful Kickstarter campaign, he had the funds to have a first sample made in Italy, at the hands of professional, experienced Italian artisans. Omondi has a great future ahead as he plans to make the MUDAXpro outerwear jacket available in specialty stores, pursue worldwide distribution, and redevelop the brand. His successful Kickstarter helped him gain the funding to create a scaleable fashion brand with high-quality craftsman products built to withstand even the most rigorous workouts. His fashion brand also had a heart behind all the hard work. 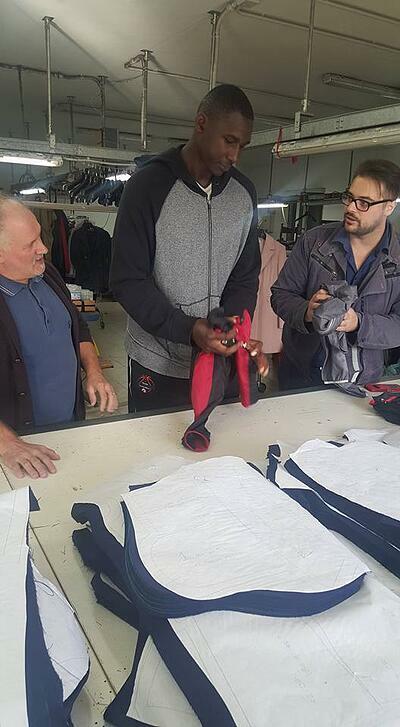 Omondi plans to give back to orphans by donating a percentage of every jacket he sells to the children in Kenya who have dreams and drive like he did.